In pack of 20 pieces. Thin Card / Rigid Paper. Cream with double sided 2 colours high definition print. Has a crease down the middle so it can easily be folded. This Roulette Players Guide shows neatly and simply the layout of a single zero roulette wheel, single zero roulette table. The Roulette Players Guide outlines betting odds, neighbours chart, general information and a place to note the numbers and colour sequences of spins. 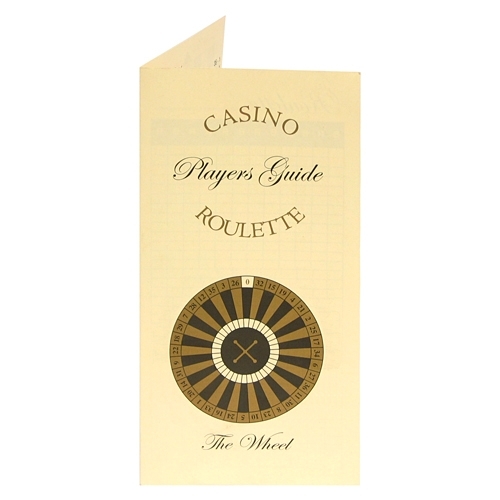 The Roulette Players Guide is very useful product when starting out for your home game to learn the rules with friends and family or just as useful for fun casino's or casino hire companies where the rules can be given out to the punters!